Of the many contradictions the member said were in the Throne Speech and the budget he said the stated goal of reducing local unemployment while revealing a twenty-five percent increase in revenue from work permits was one of the most curious. Ezzard "…more of the same." Isnt that refreshing? Finally a politician that has a consistent message, refusing to change his tune no matter what pressure he is placed under by carpet baggers who have no interest in the future of the Caymanian people. Cayman's students support Ezzard as he offering more hope and support for Caymanians than anyone else. And before you put your thumbs down look inside and ask yourself what is wrong with a man who sticks to his position? What is wrong with a man who is outspoken about protecting his countrymen and his country? I wish Ezzard would stop making noise like an empty barrel. Why don't he start making some suggestions that would improve the Govt. coffers? Some of the same issues that I hear him complaining about today ie the mental health etc. he should have dealt with when he was Minister of Health some years ago. No, no one could tell him anything then and the same today. Did he not waste govt. funds then cutting deals with that hospital in the swamp, and paying ceo $40,000 per month salary and when his contract was terminated the govt had to pay out hundreds. He really should stop talking about like he is such a saint – because he is not, but O how memories are short. You are so right 19:54 – Ezzard contributed significantly to waste of Govt. funds from his previous years in Executive Council, which is not doubt what helped to get us in this financial bind that we find ourselves in today; so he better start finding solutions instead of tearing down every idea that is tossed on the table. Frankly speaking, I don't see him contributing anything that can be used to enhance the govt. finances, I hope the people of NS are taking note that they are not getting what they were hoping for. That's right – attack the person when you cannot assail his points. To his credit, Mr. Miller has made many cost-cutting suggestions to the present Govt. all of which have been ignored. About the hospital, actually had Mr. Miller's plans for the Dr. Hortor not been aborted by the 1992 elections then we would have been in a far better position with healthcare facilities than we are now. Certainly it would have cost a great deal less than what we eventually had to spend. However, it was the politrix of the incoming govt. that bamboozled the public into opposing it. Guess who was a part of that incoming Govt. We need Mr. Ezzard Miller for Premier. A proven Leader,fiscally sound, financially conservative and Mr. Miller demonstrates that he is indeed the right person to lead Government in 2013, OR BEFORE! we need to get this Bush tyrant out of office ASAP. Cayman for some people is like Germany in 1933 – desperate to find that magic bullet/person which/who will take them out of all the problems the previous decades have gotten them into. Along comes Ezzard, promising national dignity (Caymanians are the most intelligent people in the world), a vibrant Caymanian culture of kitchen bands, jobs for all Caymanians whether they can cope with them or not and a repudiation of all that has gone before in the last 30 years. Ezzard is no Hitler but his type of appeal is dangerous nonetheless. Cayman is nothing like 1930's Germany. Apart from that you have a point. Ezzard is a rabble rousing nationalist who will only harm Cayman and the futures of Caymanians if he ever gets near power. True that Cayman is nothing lie 1930s Germany. Apart from that you don't have a point. Thank you Mr. Miller. Caymanians are being bruised on everyside with no breather. Thank you for being Real and saying it like it needs to be said. "cui bono" in simple terms means what is the good of it? what is the hidden motive. Now for all who did not understand go figure it out now. Plain and simple all the UK is asking is for us to cut spending instead of borrowing and making all kinds of deals that will just get us into further trouble. When the investors come calling for their money what will or can we tell them they will drive this economy into the ground. What is happening in the Cayman and with Caymanians? we have become so greedy and power hungry. Ezzard, along with everyone else in Cayman, is being bombarded on a daily basis with less and less REASON to support the UDP. Ezzard is a man for all seasons who can speak latin and has all the answers. 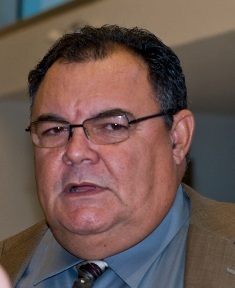 He is a gargantuan cranium in the smallest district in the Cayman Islands. maybe you'll get some comments when you translate the headline so we all can understand it. You can all understand it if you read the first sentence of the article. you mean I can have a rough guess at it. "The independent member for North Side asked government 'who benefits' from its budget when he turned to the latin phrase ‘cui bono’ "
Good for you, when you're 18 you can start building a self confidence and love for yourself that doesn't rely on trying to find people that you know one or two words more than. Or maybe not and you can grow up like a normal slug. Though you and another Einstein have assured me that all one need to do is read the first sentence, I for the life of me don't see a definitive definition there. I don't have a super-computer brain like you, Zoran. Any old brain will do so long as it actually used. i've tried it over and over rock head and for the life of me, I don't see that the term is actually defined. I just don't have the giant brain. God must have other plans for me.i am sad … i wand the big brain like you gots. Once again, thank you Mr. Miller for standing up and asking the difficult questions…..and making the statements needed! Nothing wrong with Dart doing business. Nothing wrong with anyone doing business in the Cayman Islands and becoming successful. Nothing wrong with being rich and making donations to help the economy. But here is where Government should always be neutral and pick no sides. Look at it this way, let's say, my occupation is a Traffic Officer, and I want new grass for my backyard which cost $1000 dollars, but a close friend of mine who owns a landscape company and sells grass, offers me instead $100 dollars for my entire yard. So one day, I am patrolling along Shamrock Road, and this friend of mine, is speeding breaking the law, and has not yet delivered my grass. It is my duty as officer of the law to stop and deal with him accordingly. But because he is my close friend and a good deal was made between us… well… I will allow him just this once to break the law. Such a scenario happens in the world everyday. It is called "corruption." There is no other name for it! All to say that our Governments dealings with private entities like Dart, Shetty, Ryan, Joseph, and giving them duty waivers, concessions, and favors, could come back to haunt us. The Premier gives Dart millions in duty waivers because of his charitable contributions and offers to the Cayman Islands. Dart has given the Cayman Islands government "free grass." I wonder what will Government's response be, if Dart should decide to break the law? On another note, the millions in duty waivers that Dart will receive from this Government, will more than likely give Dart a competitive advantage over local market. Better watch out that this public-private partnership don't = a controlled government monopoly where Dart would be able to fluctuate his price/cost index alot easier to win customers, clients, and take over the local business field. Don't say it can't happen. A leeway advantage over everybody else, is in the making. We are setting ourselves up! Government should never be showing favoritism to private entities! Government should always remain neutral, because the temptation for political corruption now when we are in a downturn – is great! True, yet it is our recitivist CIG leadership that suggests and perpetuates the grease:favour culture. Businesses are encouraged to curry favour and ply as directed. The trick is knowing how, where, when and to whom. These "private sector partnerships" have been "business as usual" for decades. then what could possibly be the explanation for a number of recent announcements? Never mind, on second thought the answer seems rather obvious and it has little to do mathematics other than calculating increases in the net worth of a few. Non vulgaris homo. Not the common man. While I agree with the sentiment, I am not sure that posing questions in Latin is really the way to go with this government. There is little evidence that they understand reasonable questions let alone the answers when the questions are asked in English.